There hasn’t been much separating Paul VI and St. Anne’s-Belfield boys lacrosse over the last few years. Since 2015, in fact, the two powers have faced off six times and the Saints are 3-3 over that span with the total cumulative score of the games checking in at 60-58 with STAB ahead just two goals. Friday night, STAB picked up a critical early season win, beating the defending VISAA Division I Panthers on the road 14-12 thanks in part to an explosive effort from Connor Shellenberger and Emmett Barger and a steady presence from Noah Kurtz in the cage. 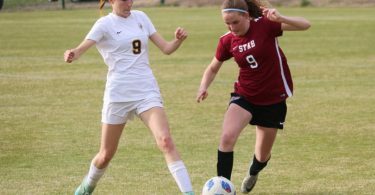 Shellenberger rang up seven points with four goals and three assists while Barger dished out three assists and notched a pair of goals. Michael McGraw chipped in two goals and an assist. With the attack locked in — and taking care of business on ground balls where Notre Dame-bound Barger and UVa signee Shellenberger each had seven individually and McGraw picked up three — the midfield was able to get in on the act too. Longstick midfielder Thomas Harry scored a pair of goals with the pole while Gunni Horridge scored twice and Fairfield signee Trent Moran and Vito Perriello had a goal each. Moran and Perriello each also had an assist. Defensively, Kurtz made 12 crucial saves against the traditionally explosive Panthers while Doug Brooks picked up four ground balls. 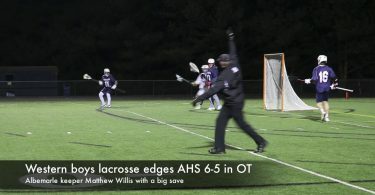 Paul VI held a 17-10 advantage on the face-off and Johns Hopkins commit Jacob Angelus scored five goals while Duke pledge Charlie O’Connor scored four goals and had an assist. The Saints head north again Tuesday to take on St. Stephen’s & St. Agnes before hosting Episcopal on Saturday.